• Hans Weijs jr.: not yet fully pleased with 11th place in J-WRC and himself…. 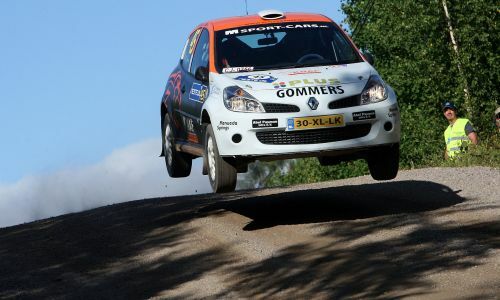 • Kevin Abbring: fantastic stages and fast times with his Renault Clio…. 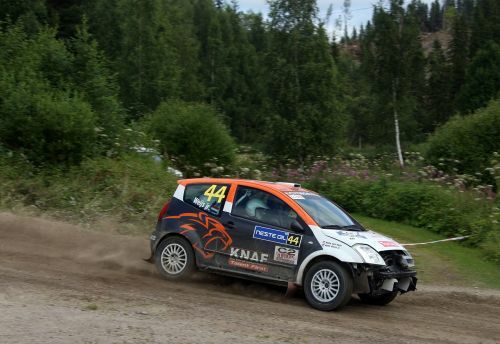 The first day of the Rally Finland saw some high and lows for the competing teams. The Finnish favourite Jari-Matti Latvala had to retire already on the second stage of the day when he crashed his Ford. Under changing weather conditions (rain and sunshine) 10 special stages were run around the city of Jyväskylä. Both KNAF Talent First Team Holland drivers gained valuable knowledge in this demanding event that asks for years of local experience to finish well. Hans Weijs drove with his Citroën C2 R2 Max all day just outside the top-10 in the J-WRC and was not completely satisfied with his own performance: "It is really difficult to ‘read’ the many jumps and you never know how fast you can attack them." The co-driver plays a very important role; Hans van Goor tries to coach Weijs the best he can: "But I was a bit late on stage 6 to call for a jump, which resulted in a heavy landing," admitted an honest Van Goor later. The result was a broken cooling system, which costed the team some 40 seconds on the stage and another 30 seconds time penalty (being late at the next TC). The team dropped a few places in the J-WRC classification, but with 11th place there is still something to win during the next couple of days! "This is the real thing…," were the first words of Kevin Abbring during the first stop in the Service Park. "You just want these stages to go on and on and that you don’t have to stop!" He was doing really well with his Renault Clio and his service crew was only busy with changing tyres, filling up with fuel and cleaning the windscreen! "Bertolotti took a wrong turning and we followed him for 5 kms in the wrong direction…. That was a shame, but fortunately without any consequences," said a laughing Abbring later. With 9th place at the end of the day and some remarkable stage times in his Finland debut made the Dutchman looking back at the first day with a positive feeling. The ‘road to victory’ in the Neste Oil Rally Finland started immediately this morning and saw a good fight between the factory teams of Citroën and Ford, with outsider Subaru looking for chances. Citroën-driver Sébastien Loeb was in the lead all day and it looks like he could be the third non-Scandinavian winner in more than 50 years time (since Carlos Sainz (1990) and Didier Auriol (1992)). He will have to fight against the Finnish Ford-driver Hirvonen (second) and Norwegian Henning Solberg (Ford) now in third place. In the J-WRC classification the Polish Suzuki-driver Michal Kosciuszko is leading, followed by the Czech Martin Prokop (Citroën C2) and Swedish Renault driver Patrik Sandell. Today’s 10 special stages were run over 129,64 km. Saturday another 10 stages are on the program.